Heat gas or charcoal grill. Cut halved pineapple in half lengthwise to make 2 triangular wedges. Cut away any remaining core. Rub pineapple and apple with the 1 tablespoon vegetable oil. Place on grill over medium heat. Cover grill; cook 4 to 7 minutes on each side or until grill marks form and fruit turns easily. Transfer to cutting board; let stand 10 to 15 minutes or until cool enough to handle. Chop fruit, and set aside. In small bowl, mix honey, mustard and horseradish; set aside. Rub pork with 1 tablespoon vegetable oil, the salt and pepper. Place pork on grill over medium heat. Cover grill; cook 15 minutes. Turn; generously brush with honey mustard mixture, and grill 8 to 13 minutes longer or until pork has slight blush of pink in center and meat thermometer inserted in center reads 145°F. Transfer to cutting board; cover with foil and let stand 5 minutes. Thinly slice. Meanwhile, make mashed potatoes in microwave as directed on pouch. Stir in cream cheese until combined. Top with parsley. 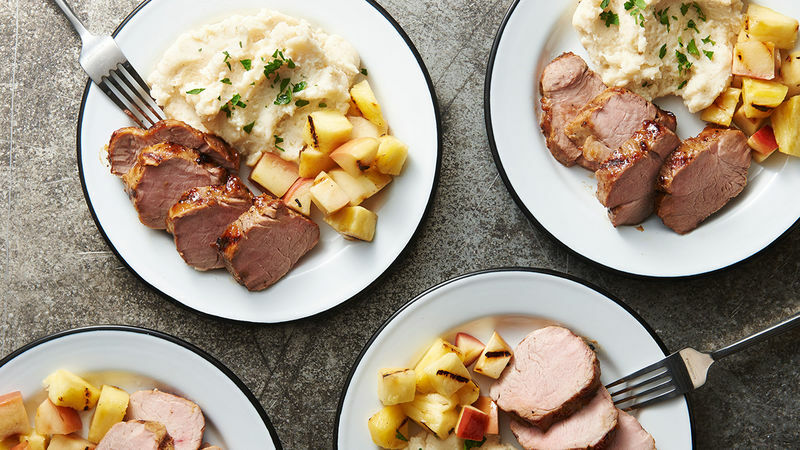 Serve pork with fruit and mashed potatoes. Traditional southern Jezebel sauce is an interesting combination of jarred pineapple preserves, apple jelly, horseradish, ground mustard and black pepper. Our version uses fresh pineapple and apple, plus Dijon, horseradish and pepper for a fun twist on the classic.